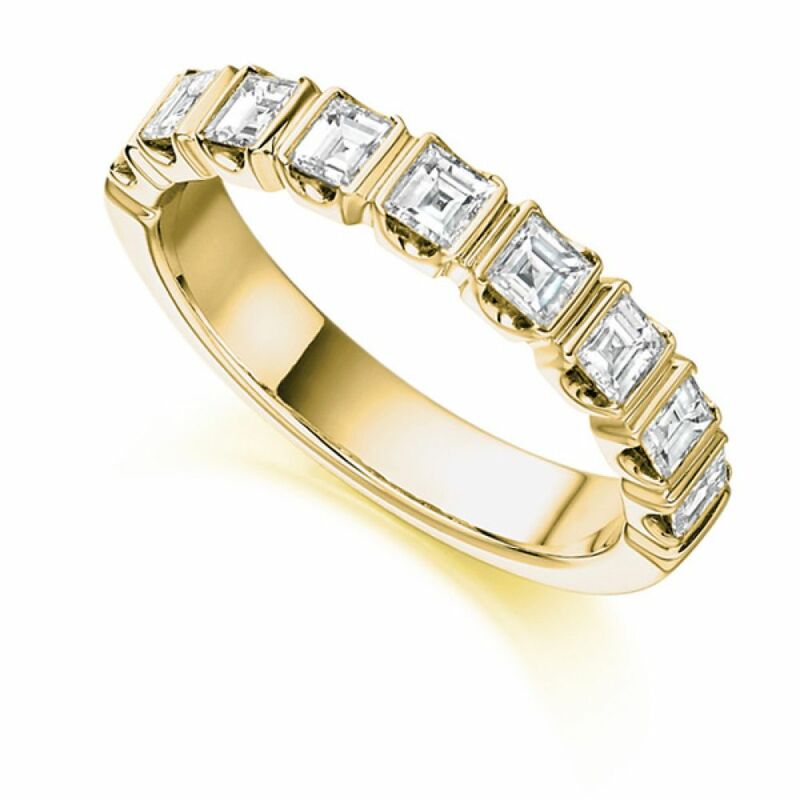 Experience the subtle sparkle and impressive fire within this square diamond half eternity ring. Held within bar settings, a total of 1 carat of square cut diamonds dazzle within a 3.75mm wide design, benefitting from a comfortable court shaped band, ideal for daily wear. Enjoy elegant and simple styling in this delightful 1-carat square Diamond Eternity Ring. Each of the nine Carré cut Diamonds achieve a whiteness grade of F - G Colour and VS Clarity for the assurance of whiteness and purity. Matched for cut, size, colour and clarity, each Diamond rests within a simple bar set design. Featured within our half Diamond Eternity Rings, and Carré Diamond Eternity Rings collection, this impressive Eternity Ring takes around 4 weeks to craft in your choice of precious metal and finger size. Choose from 950 Platinum, 950 Palladium, 18ct White Gold and 18ct Yellow Gold. Measuring 3.75mm in width, enjoy a substantial feel with a simple Diamond cut, perfect for matching to a Baguette-cut or Emerald-cut Engagement Ring. Once completed, your ring will arrive in a luxurious presentation box, securely packaged and delivered by courier to your door. Each Diamond Eternity Ring includes a detailed insurance valuation, Diamond Eternity Ring certificate, 60 days returns and a lifetime warranty. Please contact us for more guidance on any of our Diamond Eternity Ring styles.